I'm sure everyone is familiar with the ads that show people lounging on a boat in some tropical location, drinks in hand and with no apparent care in the world. This is a lie. Don't believe it. There is no such thing as the perfect sailboat. Boats are all about compromises, and a major compromise is in the time and effort it takes to maintain a boat. Don't be fooled by the myth of leisurely living on a sailboat, it is actually a lot of hard work and involves long periods of physical discomfort (imagine trying to sleep on a narrow, hard couch as it is violently tossed around the room for days on end, while someone squirts you and your bedding with salt water. That's often what it is like.) The leisurely moments are only rewards for long days and weeks of fixing things, sanding things, varnishing things, hauling things, and buying things. Lots of things. Any used boat will involve quite a bit of maintenance and upgrades. 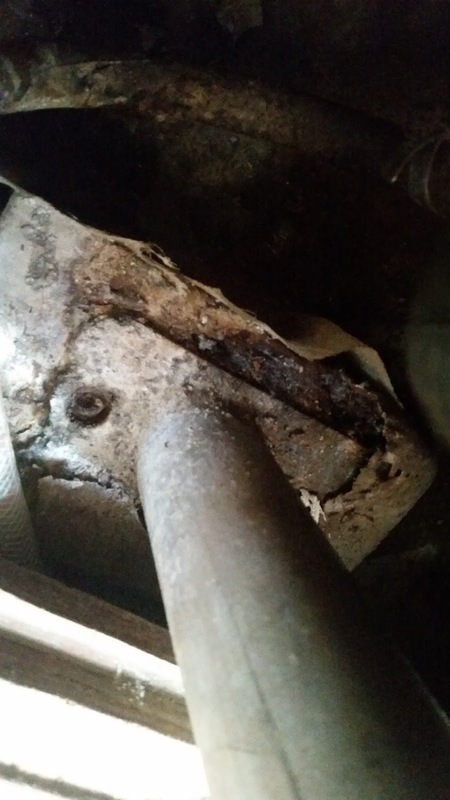 I have seen even well-maintained boats becoming derelicts after just sitting in a slip for a couple of years, as gaskets and seals rot away, pipes and hoses dry up and crumble, as the relentless sunshine and humidity degrades everything onboard. Just keeping up with that a constant battle. Relying on others to do the work is foolish, since no one will ever care about your boat as much as you, aside from the fact that finding a qualified and honest contractor is actually quite hard (never mind the cost!) I was well-aware that boats will require much more maintenance than planned, and that any project will inflate into a much larger one quite quickly...but the amount of work required is still quite surprising. Boats require maintenance. I have yet to meet anyone whose boat is actually in perfect condition and required no additional work. Personally, I don't consider that negative at all, and in fact I enjoy working on my boat very much. More importantly, since the Master of any vessel (notice I didn't use the term "Captain") is always totally responsible for everything that happens on their boat, and since no one can really expect to get mechanical help quickly enough in case of an emergency while at sea, it is very important to get to know everything about your boat and how to fix any problem that may arise. Lives are quite literally at stake, and if something goes wrong, you can drown just as easily a few yards from land as miles offshore. Small issues can quickly add up to big problems. You need to be familiar with literally every wire, every nut, every bolt and every fitting - and you have to expect and be prepared to act when any one of these fails catastrophically in dire circumstances -- and there's a good chance they will. Fixing up a boat should therefore not be seen as a distraction but rather as a very important part of seamanship, because it is the only way to really learn your boat. So in short, if you're in the market for a sailboat, make sure you know what you're getting into, and that you are willing to commit both the time and resources to manage a steep learning curve. This is the only bit of moralizing you can expect on this blog, aside from an up-coming rant about drunks and careless boaters. Welcome! 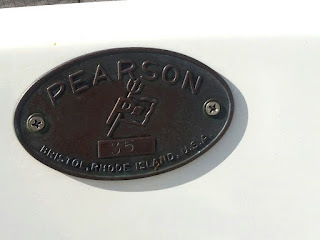 This is a blog about restoring my 1967 Pearson 35, hull no. 35. Since I learned a lot from the various blogs, videos and comments posted online by others, I hope to return the favor and contribute my experiences with this project in the hope that it may be helpful to others, especially first-time boat owners and dreamers. Pearson Yachts was a venerable brand name among American boatbuilders, and their older models from the late 1960's and early-70's have a good reputation as stoutly-built and sea-worthy vessels with thick, solid fiberglass hulls. They went out of business in the 1990s, and the last Pearson 35 was built around 1980, with about 500 sold in total. Any sailboat design is a compromise between various competing considerations. In selecting a boat, my primary concern was safety, followed by versatility and ease of handling. I selected the Pearson 35 model because it met my requirements, and they are generally less expensive than similar-sized sailboats of the era due to the centerboard, which many potential buyers wrongly assume presents a significant headache. On my boat, the first project was re-attaching the centerboard cable that had parted. This was really not such a big deal. All that was necessary was a pipe-wrench and a few feet of stainless steel wire cable with an eyesplice. Of course you have to pay a bit more attention to the compartment where the centerboard lives when scraping the hull clean of marine growth, and that's really about it. Oh, should the cable part again, don't yank it out all the way! The centerboard increases the draft from just under 4 feet (1.2 meters) when raised, to 7.5 feet (2.3 meters) when lowered. A shallow draft allows easy access to many marinas, inlets, harbors, and bommie-strewn bays where other boats dare not venture. Gunkholing becomes much easier when you don't have to worry about draft, and I can anchor a few feet from any sandy beach in waist-high waters. Since my cruising grounds are primarily off of the Florida Keys and the Bahamas, this is an important consideration, plus there are no problems finding an anchorage or passing under ICW bridges, etc. Hauling up an anchor using a manual winch from just a few feet of water is much easier too. There's also a safety benefit in being able to find shelter quickly and easily in shallow waters in case of a sudden and unexpected change in weather. The initial survey showed no real big surprises for this particular boat, which came with no extras such as electronics or after-market gear that would only add to the headaches in a refit. The boat was judged to be in "average" condition by the surveyor, with the usual problems expected of a boat of this age. However, the engine, wiring and other fittings were in good shape, as was the rigging. The mainsail is in good shape too, with many years left in it. I will add lazy jacks, and a Harken roller-furling foresail, and may replace the shrouds and turnbuckles just to be sure though they are in good shape. 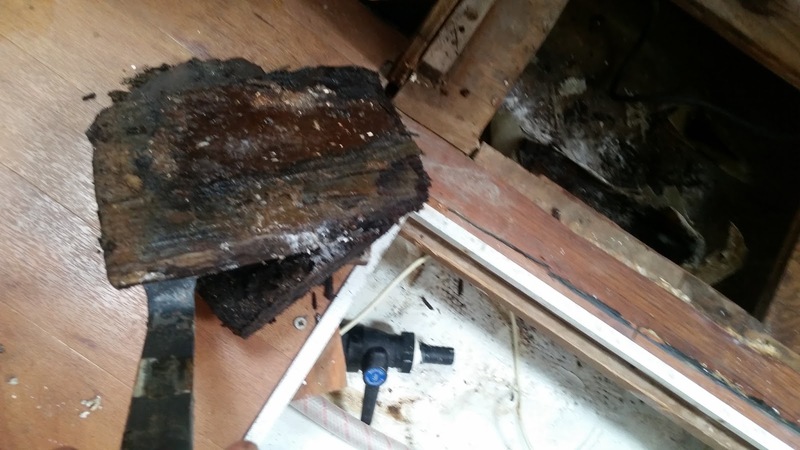 The most significant problems were the small wet spots in the deck around some fittings and the mast base. The deck-stepped mast is supported below by an aluminum compression post, which is itself supported by a block of wood sheathed in fiberglass. On my boat (and many others) this block of wood rotted away long ago and had turned into a wet sponge (the shower pan and anchor locker drain hoses ended right up against the compression post block!) causing the mast to press down into the deck. In turn, that led to water intrusion around the mast base into the balsa core of the deck. I had to dig out the wet balsa core there, and replaced it with a thick G10 fiberglass sheet. Compression post base - where are the bolts? Never found them. A wet sponge was holding up the mast compression post! The wooden block below the compression post was also replaced with a 3-inch thick block of G10, which was probably overkill. There were also a few wet spots around a couple of stanchion bases and cleats. Since I planned on re-bedding all the deck fittings anyway, using more substantial backing plates than the original fender washers and wooden (dry-rotted) backing plates fixing these wet spots was inevitable. My goal in restoring the boat was first to "Keep It Simple" and to try to keep as much as the original character of the vessel as possible, especially the 1960's-style interior. I also wanted to make her easier to sail single-handed so I replaced the steering wheel with a tiller (ridding myself of the complications of the steering quadrant, chains, pulleys etc., while also significantly opening up the cockpit space) and upgraded her old winches to larger-sized self-tailers. I also plan to remove the traveler entirely in favor of end-boom sheeting, add telescoping emergency boarding ladders on each side, and move the water tank from the bow to under the settees. New electronics will be added, including full instruments, radar, AIS transponder, autopilot, wind monitor, VHF with RAM, and two Raymarine multifunction displays for the cabin and cockpit helm. I was considering lithium-iron batteries but have decided to hold off on that for now, until the kinks are worked out of the technology (after witnessing one boat on fire as a result of poorly-designed lithium batteries with corroded connections and too-tight packing of the cells resulting in too much heat accumulation, I had second thoughts about the batteries.) I'll exchange the wet-cell battery with larger capacity AGMs and add a starting battery, as well as solar panels on a hard bimini that I will build too. Of course, I have all the latest safety gear, including a Viking 4-person valise liferaft, two EPIRBs, and four sets of offshore PDFs (each with their own PLBs and lights) and a LifeSling system. I also invested in a MOB alarm, particularly for any kids on board. I decided to forego an SSB radio in favor of a satellite tracker and telephone. I also added teak handrails inside the boat, at shoulder level below the portholes. The automatic bilge-pump will be replaced by two larger capacity models, with a high-water alarm. Naturally I will add fire, carbon monoxide and propane alarms too. I also have a spare anchor, a Fortress stern-hung anchor, a sea anchor, and a drogue. All the portholes were removed and replaced with a total of eight opening portholess, which significantly improve ventilation below. The original small, oval-shaped portholes were not of much practical use anyway, and the large fixed ports were starting to leak. Other upgrades to the galley include a new Dometic stove with a dedicated propane tank locker, and a new stainless steel sink, as well as a wall-mounted manual coffee grinder (no power consumption, and single-handed operation -- very important on a heeling sailboat.) I have not yet investigated the icebox and don't know how well that works, though it seems reasonably functional. I'll install new fans and new LED lighting, as well as a new tricolor masthead light and spreader lights. A 400-watt stereo system with 4 speakers, plus a DC-powered LCD monitor, all connected to a laptop computer loaded with navigation apps which is safely tucked way in a waterproof compartment and operated using an illuminated wireless keyboard, complete the electronics upgrades. I am also redesigning the anchor locker and adding a hatch on deck instead of using the v-berth hatch, adding new teak hand rails inside and outside the cabin, as well as folding mast steps. I don't want a windvane or wind generator but I will carry a large-capacity car booster battery for back-up power. No pressurized water, water heater, air conditioning etc. either. I am now in the process of repainting the boat entirely. This is probably the hardest project since it is not only very time-consuming but also very detailed and hard work. It took months to remove all the old fittings, the nasty old nonskid that was itself mixed with sand and therefore impervious to my sander, and the damaged gelcoat underneath that. Filling, fairing, sanding and priming the deck under the hot Florida sun, while tormented by vicious no-see-ums and other biting insects, and while covered in fiberglass dust, was no fun at all. I have to also paint the ceiling of the cabin interior. The old paint comes off in strips, Removing the old paint is not an easy job since sanding or grinding will remove the texture pattern on the cabin liner, so I can't just take a grinder to it. I'm considering using paint stripper, heat guns, wire brushes and 3M Roloc bristle disks for that job. Currently the boat has a navy blue hull. 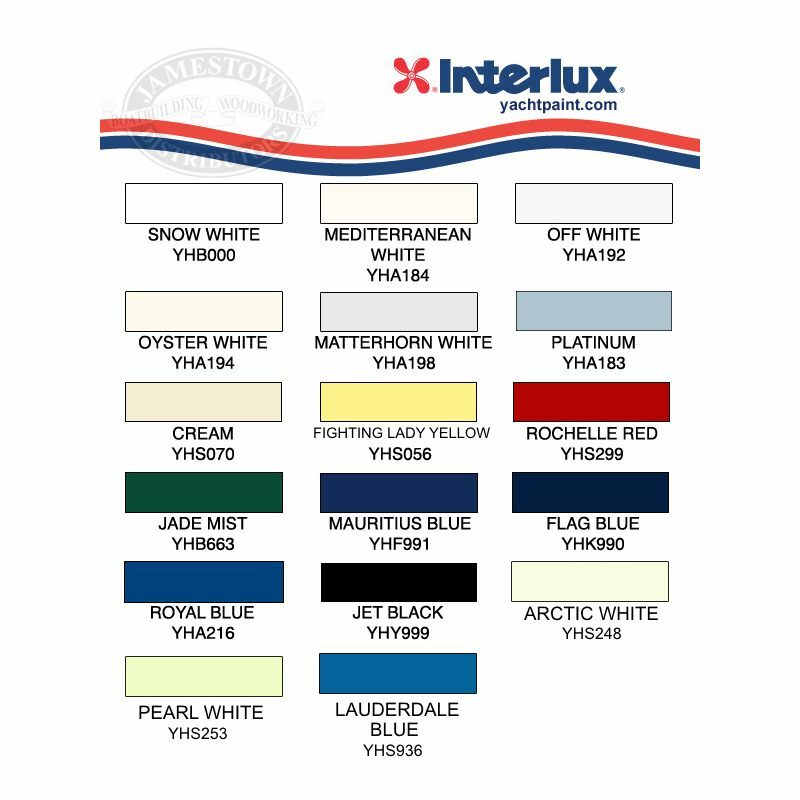 Dark colors are too hot for the tropics, and the paint is chipping off anyway, so I plan to go with Interlux Perfection Fighting Lady Yellow. The deck will be white. I'll be using KiwiGrip nonskid paint too. 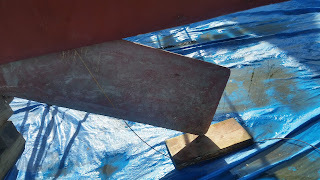 Since painting with two-part paint is really an art, and getting a good finish using the roller-tipping method is MUCH harder than painting a house with latex paint, I had to practice a lot on a dinghy. It took several layers of paint before I "got the hang of it" with a reasonable finish. I still don't have it down pat -- you can see the lines between patches if you look very closely. Too closely. Anyway, please visit regularly as I plan to update this blog more often now.